SVXes sold in the USA from 1996 onwards were fitted with a different type of ECU and TCU in order to support the OBD2 standard. Late model SVXes are rare and we have not had much opportunity to research these units. The hardware is the same as that used in some Impreza and Legacy models of the same year. As far as we know, this ECU supports OBD2 and SSM1 protocols - not SSM2. There are plenty of OBD2 compliant scantools available which should work on the OBD2 SVX. 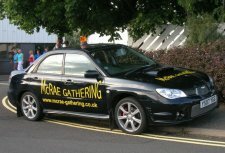 There is also a fair amount of information available on the internet about communicating with and modifying OBD2 Imprezas. Much of that information will probably apply to the SVX. It just needs somebody with an OBD2 SVX and computer/electronics skills to investigate it. If anybody undertakes such a project then I would be interested to hear about it. 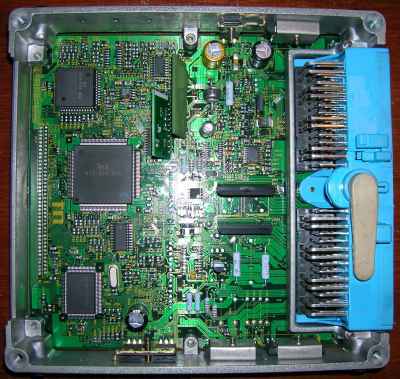 Tim Smith sent me a memory dump of his 1998 impreza that uses this type of ECU. From looking at the file, it appears that the CPU is a later version of the M377xx family used by the older OBD1 cars - possibly M3775x. Please note that the ROM dump and disassembly of A30130 is not complete because there appears to be an area of ROM above 0xFFFF that cannot be read using SSM1 protocol. Thanks to John Spiro-Colwell for sending me the pinout for this ECU. OBD2 ECU Pinout.